The Young Victoria, while full of history and the lineage of the British Monarchy, is an interesting film which can capture the attention of even the less knowledgeable of the history behind it. While it may be slow at first, introducing the family and setting up the plot, it becomes quite the opposite as it blossoms into a quite charming drama. The young Princess Victoria (Emily Blunt) anxiously awaits her 18th birthday, as heir to the English throne. Her mother the Duchess of Kent (Miranda Richardson) and her advisor Sir John Conroy (Mark Strong) have other plans however, as they try to set up a Regency on account of the young age and inexperience of the Princess. But the strong willed Victoria would have nothing of the sort, and at 18 years old she became the Queen of England. But under the Kensington system, which the young Queen had hated for her entire life growing up, there were still many rules that kept her mother and John Conroy close by. These rules would stay in existence until she marries, which the strong-willed Victoria did not rush into. 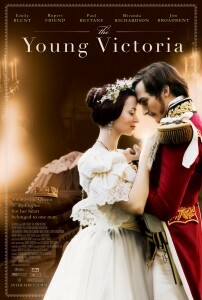 While there were an ample supply of suitors, The Young Victoria found a fond interest in Prince Albert (Rupert Friend). The film is supported by many strong actors, who do an excellent job representing the people that impacted the life of the young Queen. Lord Melborne, advisor to the Queen, is played by Paul Bettany. His presence on screen is seldom overpowered by the other actors, as he portrays the wise and powerful Prime Minister. Though there was always a feeling that Melborne wanted more than to console the Queen on political matters, he always remained a close friend and counselor. Emily Blunt portrays the Queen as eliquantly and strong willed as you would hope. She is very believable in the role, and seldom do you feel that the throne is too big to fill for the young actress. Rupert Friend is another actor that fills his role quite well, as the Queens companion and best friend throughout their time together. There are many other performances to note, like Jim Broadbent’s as King William IV, Victoria’s loving uncle who she would succeed as Sovereign. Also, Mark Strong plays a very unlikeable Sir John Conroy, and does so perfectly. Overall, the movie is quite endearing even for those who seldom fancy a good period piece. The performances come across very well, and everything from the costumes to the scenery paint a picture of 17th Century England. The story of the Young Queen Victoria is very intriguing, and the romance that grows between her and Albert makes for a touching story. The Young Victoria continues the trend of successful royalty based period films that feel fresh and cotemporary and historically intact all the same and it is all grounded by a great turn by Emily Blunt as the title character. The film opens as a political battle of posturing and manipulation surrounds the British thrown as the only heir is in fact and heiress and not of age. Victoria’s mother is being controlled by Sir John who hopes to be the puppet master to Victoria’s crown if and when King William passes on. Victoria though is resilient and will not relinquish her rights as Queen to a Regent (Sir John) and the deadline to her eighteenth birthday becomes on the minds of everyone that hopes to avoid John’s play including Lord Melbourne who lends his aid to the future and her policy making and maybe hopes to be a possible suitor. In league with Sir John is King Leopold of Belgium who hopes to gain influence and alliance with Britain and he sends his sons, and Victoria’s maternal cousins, to swoon her into possibly becoming a suitor for her. Albert and Victoria begin to form a fruitful friendship and political tensions reach a fever pitch as William grows weak and Victoria has yet to become of age. The film is beautiful to look at and shot on location in a number of the real locations from Victoria’s life and it brings so much authenticity to the picture. Throw in some fantastic costumes and production values and the film feels like it was captured during the original time period. Jean-Marc Vallée directs them superbly, sneaking in clever shots and tricks that make the film feel new and it complements the old feel of the picture perfectly. He really shot the hell out of this movie and he and his team did a great job at making the film feel timeless and modern all at the same time. The plotting and pacing of the picture is also extremely tight and doesn’t waste a moment. I enjoyed the films political intrigue that fills the first half quite a bit as well and wish there was more of it actually. Though the courting and relationship struggles that play more into the second half of the film almost work just as well and provide engaging drama as well. The actors in the film are all top notch with Emily Blunt leading the way as the heiress to the throne. She commands the screen and her subjects with confidence and when the time comes she can show how powerful she really can be. Blunt is just great as the powerful princess and is one of the finer turns of her career. Rupert Friend is also quite good as Albert and is just the right parts awkward and assertive and plays off Blunt well when she gets quite overpowering. Paul Bettany is fantastic as always as Lord Melbourne and his chemistry with Blunt matches that of Friend and he has an edge to him to boot. Jim Broadbent is great in his short work as King William as is Thomas Kretschmann as King Leopold. Mark Strong and Miranda Richardson are also quite devious and enjoyable as Victoria’s mother and Sir John and you can easily get behind Victoria when she stands up to them. In the end, The Young Victoria is a very enjoyable and exquisitely filmed picture that balances the period look with contemporary sensibilities to make a picture that feels both old and new. Filled with wonderful performances at every turn, Blunt stands out of the pack with possibly here best turn yet and shows off a great range of chops here. Bettany is great as well and one of the few complaints I have on the film is that there isn’t more of him in the film. The film is accessible to anyone and even if you shy away from period films I think you should give this a shot as it follows in the footsteps of Marie Antoinette and The Duchess as period films made with a modern feel making them both beautiful and engrossing and never dull.